A week ago, last Wednesday (May 23), while I was away in observance of a Jewish holiday, Rush Limbaugh read my column, “Meet Your ‘Moderate,’ ‘American’ Muslim Neighbors: New Study Shows U.S. Muslims Are Extremists” on the air. I’ve been meaning to mention and acknowledge it, but with all the holidays, American and Jewish, I didn’t get to it. Better late than never. RUSH: I was preparing for this program last night and spinning through the news, kept seeing all these news stories on this Pew study about how moderate Muslims in America are. I ignored it because the instincts just took over. I got a collection here of headlines to illustrate things that I saw last night, and these headlines seem to present a uniform picture of the good assimilating moderate American Muslim. My experience with the Drive-By Media is that once one of them reports something, they all pick up on it, the same theme — I just don’t trust it. So I got in here today and I really wasn’t going to pay much attention to this, and I read a piece by Debbie Schlussel at her blog, DebbieSchlussel.com, and she starts out this way. She says, “For almost six years, we’ve heard the constant chorus: ‘Muslims in America are different.’ On 9/11, we were told that American Muslims would never commit the attacks like those perpetrated upon 3,000 Americans by 19 foreign Arab Muslims in our midst. The 19 men were different than Muslims in America, because they ‘hijacked their religion,’ we were told. On 7/7, we were told that European Muslims are different. We were told that American Muslims would never try to blow up subways and train stations here, unlike those in London who did it ‚Ä¶ twice, and those in Madrid who killed far more on their trains. We were told — and continue to be told — that American Muslims would never continuously riot in the streets, burning hundreds of cars a day, as they’ve been doing throughout France, going on 3 years, and violently attacking and injuring more than a dozen police per day. American Muslims are different, we’re told. They’re far more assimilated, far more successful financially,” blah, blah, blah, blah, blah, blah. “Eight percent of all U.S. Muslims said suicide bombing is justified. Add to that the 9% that don’t know/refused to answer, and you get 17%, almost 1 in 5 American Muslims,” support suicide bombings. It goes even further. We’ve heard for a long time that American Muslims, that Al-Qaeda doesn’t represent Islam, and Al-Qaeda’s hijacked the religion. “More than one in four American Muslims, aged 18-29, support Al-Qaeda. 7% outright viewed it favorably, plus 19% don’t know/refused to answer–for a total of 26%. Yup, more than one in four young Muslims in America supports Qaeda. One third of American Muslims age thirty or more support Al-Qaeda. 4% support the group outright, plus the 29% that refused to answer, for a total of 33%. If you can’t answer an outright no to this question, you support Al-Qaeda. Of all American Muslims, only 58% have a very unfavorable view of Al-Qaeda.” Well, okay, fine, but 42% do. Nice to see you getting the recognition you deserve. At least he cited your work without giving himself credit. Debbie, if you ever date Rush I’d yack up everything I ate for the last week. BTW have you dated anyone I’ve heard of? Dear Debbie, it’s about time you’re getting the proper recognition you deserve for all the hard work that you’ve done. Hopefully more people will read your Blog and things will change in this country. Way to go! 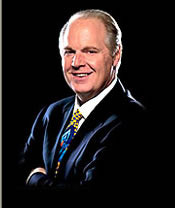 I’m glad that Rush is learning about islam/Muslims from you, instead of pro-Islam apologists like Grover Norquest. On a more flippant note, you look like becoming the Maharushi’s Guru. Hee hee. I see he gave you credit this time. Good for you. Keep right on pointing out the actual numbers, my dear. It is precisely the sort of information everyone needs to know…….whether they want to hear it or not. 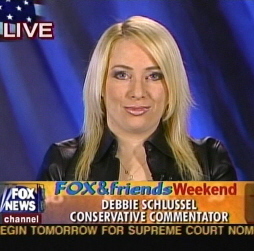 Debbie, I read your piece a while back and in fact, heard El Rushbo’s commentary (with credits). I think he did a very respectable job of reporting on your work. Either way, the bottom line is that these “people” are all the same in their hearts – evil. In a more normal America (pre-demogogue) the correct answer would have been that there is zero reason to murder innocents. Between this incessant cancer that is spreading and the shamnesty program, it can only be 12-18 months before a another civil war breaks out. Those idiots in Washington are selling their own people and country out right before our very eyes. It’s the ultimate in hubris. Rush, now if we can just get you to notice that the Mexicans aren’t coming here to become American, either, and that YOUR party has probably already destroyed the US; there are too many non-white, non-English-speaking foreigners here for us to absorb. They don’t like us and they have a racially-supremacist plan to breed us out of existence. Meanwhile, you keep focusing on how rotten the Dems are? The US is finished, dummy. I was listening that afternoon when Rush started quoting your work and he was darn careful to note it was yours–as he has usually done in the past too. Isn’t the obvious point of this data being confirmed every day in the news with what continues to happen with the actions of these terrorist nuts (includes all sympathizers–admitted and otherwise). Today the news is about a few more plotting to blow up JFK airport. A larger and larger portion of the general population is gradually waking up to what is going on and they are fed up. What will we/they actually do? That’s a bigger question, isn’t it? What is the “final solution” in dealing with muslim islamofascism? Do we tolerate it? One thing is for absolute certain—we need to keep the lights on the reality of our enemy’s total hatred and deal with it accordingly.